Vicenza is a comune and city in the Veneto region, in Northeast Italy. Vicenza is the capital of the province of the same name. The city is about 60 km (37 mi) west of Venice, the capital of the region, and 200 km (120 mi) east of Milan. A collage of Vicenza showing: the Villa Capra "La Rotonda", the classical temple in the Parco Querini, a panorama of the city from the Monte Berico, the Piazza dei Signori and the Renaissance Basilica Palladiana. Lua error in Module:Location_map at line 488: Unable to find the specified location map definition: "Module:Location map/data/Italy Veneto" does not exist. Vicenza is a cosmopolitan city, with a rich history and culture, and many museums, art galleries, piazzas, villas, churches and elegant Renaissance palazzi. With the "Palladian Villas of the Veneto" in the surrounding area, and his renowned Teatro Olimpico (Olympic Theater), Vicenza has been listed as an UNESCO World Heritage Site since 1994. 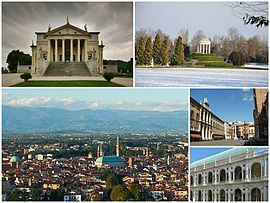 The city is also known as the "City of Palladio" after Andrea Palladio, an architect that designed and built several important buildings in Vicenza and other cities. Vicenza is at the confluence of the Bacchiglione river with its tributary Retrone.The comune of Vicenza has an area of 80.57 km2 (31.11 sq mi) to the north of the Berici Hills. Its average altitude is 39 m (128 ft). Vicenza borders with the following comuniː Altavilla Vicentina, Arcugnano, Bolzano Vicentino, Caldogno, Costabissara, Creazzo, Dueville, Longare, Monteviale, Monticello Conte Otto, Quinto Vicentino and Torri di Quartesolo. The following frazioni (hamlets) are part of Vicenza: Anconetta, Bertesina, Bertesinella, Bugano, Campedello, Casale, Debba, Longara, Maddalene, Ospedaletto, Polegge, San Pietro Intrigogna, Santa Croce Bigolina, Tormeno. The climate of Vicenza is an oceanic climate with template summers, Cfb (Marine West Coast Climate) in the Köppen climate classification. The average temperature for the year in Vicenza is 12.8 °C (55.0 °F). The warmest month, on average, is July with an average temperature of 23.1 °C (73.6 °F). The coolest month on average is January, with an average temperature of 2.2 °C (36.0 °F). The average amount of precipitation for the year in Vicenza is 1,087.1 mm (42.8 in). The month with the most precipitation on average is November with 109.2 mm (4.3 in) of precipitation. The month with the least precipitation on average is July with an average of 73.7 mm (2.9 in). As of 1 January 2016[update], there are 112,953 persons living in the comune, for a population density of 1,401.9 inhabitants/km². Piazza dei Signori and Palazzo dei Trecento. ↑ "Statistiche demografiche ISTAT". Demo.istat.it. Retrieved 1 December 2017. ↑ "Comune di Vicenza" (in Italian). Tuttitalia.it. Retrieved 20 May 2017. ↑ "Comuni limitrofi a Vicenza" (in Italian). Tuttitalia.it. Retrieved 21 May 2017. ↑ "Vicenza, Italy - Köppen Climate Classification". Weatherbase. Retrieved 21 May 2017. ↑ "Statistiche demografiche ISTAT" (in Italian). Demo.istat.it. Retrieved 20 May 2017. 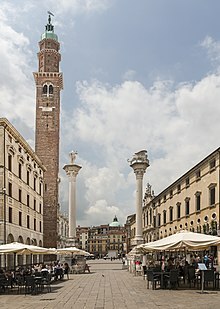 Wikimedia Commons has media related to Vicenza.